Electricity is the often forgotten power source that allows us to enjoy a huge percentage of our daily activities. We use electricity constantly and can take for granted that electricity is an incredibly powerful force of nature. Even the static charge accumulated from dragging our feet across carpet can give a nasty jolt. Electrocution of a more serious degree can lead to traumatic injury or even death. However, when electrocution is the result of the reckless or negligent actions of another party, electrocution victims and their family may be able to recover compensation for their damages through a personal injury claim. The personal injury attorneys of Kamensky, Cohen & Riechelson have 45 plus years of experience helping clients recover full and fair compensation for their injuries as a result of serious accidents, including those involving electricity. Lean on the experience we have built through winning successful verdicts and settlements for Pennsylvania clients throughout towns like Levittown, Northeast Philadelphia, Bensalem, Millbrook, Feasterville, Penndel and the greater Bucks County region. Call our office today for a free and confidential consultation regarding your electrocution accident injuries and your potential personal injury claim. Falling injuries – falling as a result of an electrocution is a common occurrence. Coming into contact with live electrical wires is one of the most dangerous hazards leading to construction accidents, slip and falls, ladder and scaffolding accidents, and other injuries which involve falling from heights. Burns – Most serious electrocutions result in some type of burn. Burns which are caused by electric shock are not always apparent as they may not show on the surface of the skin. Many serious burns are internal as a result of high voltage charges. Electrical incidents also may result in fires, which can of course lead to external burning as well. Internal Organ Injuries – electric shock can effect the internal organs of humans in a variety of ways. Our bodies are highly conductive of electricity, and high voltage shocks can lead to cardiac arrest, inertial organ damage, nervous system issues, and more. 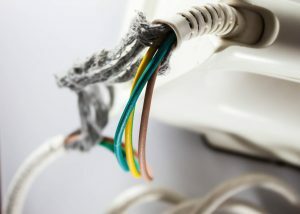 Who is Liable for my Electrocution Injuries in Bucks County, PA? If you have suffered an injury as a result of the negligent or reckless actions of another party, who can be held liable? This is heavily dependent on your exact situation, but will often involve either construction accidents, premises liability, or defective product claim. Many electrocutions which take place in the home are a result of either faulty wiring, unsafe home conditions, or small appliances. There may be different liable parties depending on how and why your accident occurred. For example, let’s say you were injured due to a rodent infestation leading to compromised wiring in your rented apartment. Your landlord or property owner may be found at fault for failing to maintain safe conditions. This would be considered a premises liability claim. Another example may be a malfunctioning product which led to electrocution. If we are able to show that you were using the product as intended and were still injured, we may be able to hold the manufacturer liable under defective product liability statutes. No matter what the situation, our Bucks County attorneys will do everything we can to show that your accident was due to the improper actions of others. At The Law Office of Kamensky, Cohen & Riechelson, our personal injury attorneys have been protecting the legal rights of our clients since 1972. We have extensive experience serving clients injured by electric shock in Pennsylvania towns including Northeast Philadelphia, Levittown, Penndel, Bensalem, Feasterville, Millbrook, and all of Bucks County. We are here to find fault in your case and to seek full and fair compensation for the damages incurred. Call our Bensalem offices at (215) 337-4915 or contact us online today to speak with a member of our personal injury team. We will be standing by to hear more about your electrocution accident, injuries, and to discuss your potential personal injury claim.